Make this bright and airy contemporary home your summer getaway for island adventures! 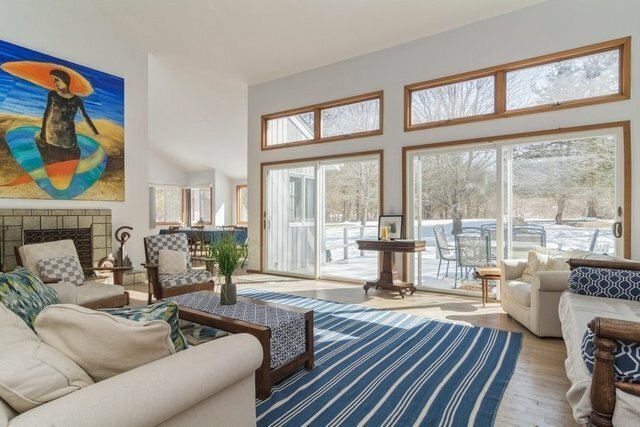 The spacious, double-height living room has a wood-burning fireplace and double stacked windows allowing ample natural light to flow throughout. Open the sliding doors and step onto the large outdoor deck with BBQ for outdoor dining overlooking the 4 acres of land the property is situated on. Mature landscaping and sprawling lawn make the perfect backdrop for summer activities whilst offering privacy and a quiet setting. The open kitchen and dining room lead to the den and enclosed sunroom. The large master bedroom is located on the first floor, with en-suite bathroom and generous closets. The recently renovated powder room and the laundry room complete the first floor. Upstairs you will find two guest bedrooms, the loft with added sleeping space for all your guests, as well as a guest bathroom. Ideally located close to golf, beaches and just minutes away from restaurants and local bars, this home is the perfect vacation destination!